"Cabbage leaves stuffed with hamburger, rice, tomatoes, and cinnamon." 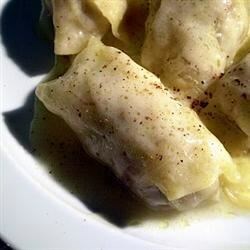 Watch how to make stuffed cabbage rolls with gravy! Tasty filling. Next time I will try adding a tomatoe sauce over the rolls.